Today on the CLL Society website, we share an interview with Laura Cleveland, a CLL patient whom I interviewed at the CLL Society and Leukemia and Lymphoma Society sponsored patient dinner held the night before the CRC (CLL Research Consortium) patient forum in San Diego in April 2015. We discussed the role of patient advocacy in clinical trials for CLL. Please take a look here to see the interview. Although it is 5 weeks away, we're busy filling our schedule with meetings with other CLL and Lymphoma organizations, reviewing abstracts and scheduling interviews at the American Society of Hematology Annual Meeting in Orlando. Simultaneously, we are putting together the next issue of The CLL Tribune, due out after ASH. If you haven't had a chance to peruse the first issue, you can access it here. SAVE THE DATE: If you live in the Los Angeles area, please consider attending a post-ASH patient education forum and CLL Society LA support group launch in conjunction with City of Hope scheduled for Saturday, Dec. 12, 2015. A flyer with more details will be posted in the next week or 2. Finally, if you are receiving this email through a CLL Society Alert, you are all set. If you are receiving this through another method and haven't already, please sign up here. 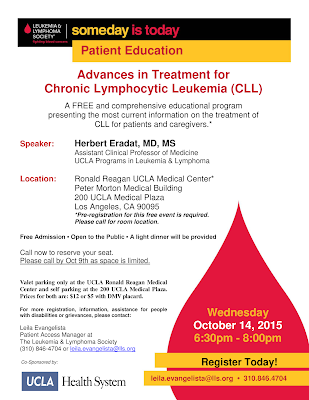 Also, please forward this email to a fellow patient or caregiver who might benefit from knowing more about CLL. 1. An interview with Dr. John Gribben whom I interviewed at the CRC (CLL Research Consortium) Scientific Meeting in San Diego in April 2015. We discussed his approach to cellular immunity and T cell function in CLL. Please take a look here to see the interview. 2. A patient-friendly summary of three new Immune Antibody clinical trials from MD Anderson Cancer Center. These investigator-initiated trials are exploring how activation of the immune system may lead to killing of CLL cells. You can read more about these interesting trials here. This Fall has been incredibly busy so far, between traveling to Australia for the iwCLL meeting and an Australian patient support meeting, publishing our first issue of The CLL Tribune, and traveling to Brooklyn for the North American Educational Forum on Lymphoma hosted by the Lymphoma Research Foundation. Now we're preparing to go to the American Society of Hematology Annual Meeting in Orlando, FL and putting together the next issue of The CLL Tribune, due out after ASH. If you haven't had a chance to peruse the first issue, you can access it here. SAVE THE DATE: If you live in the Los Angeles area, please consider attendinga post-ASH patient education forum and CLL Society LA support group launch in conjunction with City of Hope scheduled for Saturday, Dec. 12, 2015. A flyer with more details will be posted in the next week or 2. Finally, if you are reading this on blog and haven't already, please sign up here. 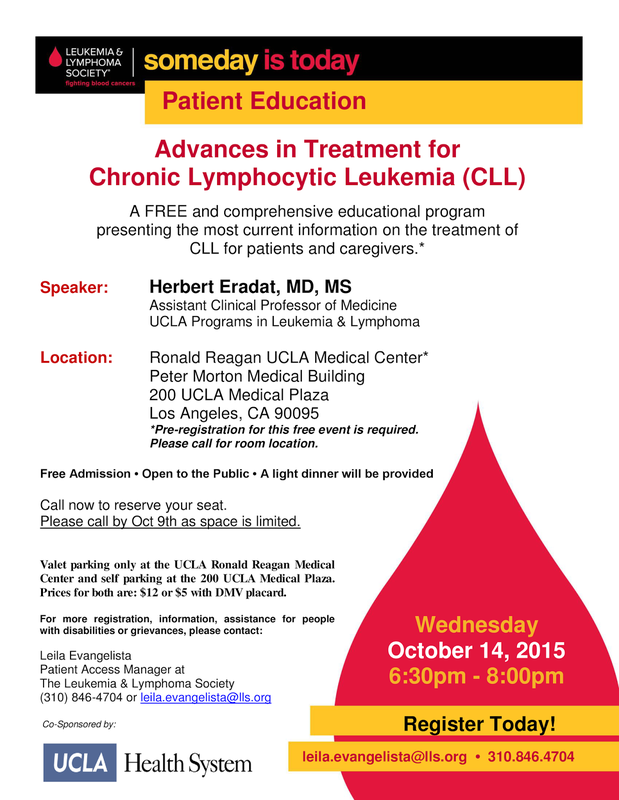 Also, please forward this email to a fellow patient or caregiver who might benefit from knowing more about CLL. Here are best answers to some questions I recently received. Please email questions as it is difficult to respond this way. Remember I am not a hematologist, pathologist, or transplanter. ANSWER: CD5 is usually only found on T cells. 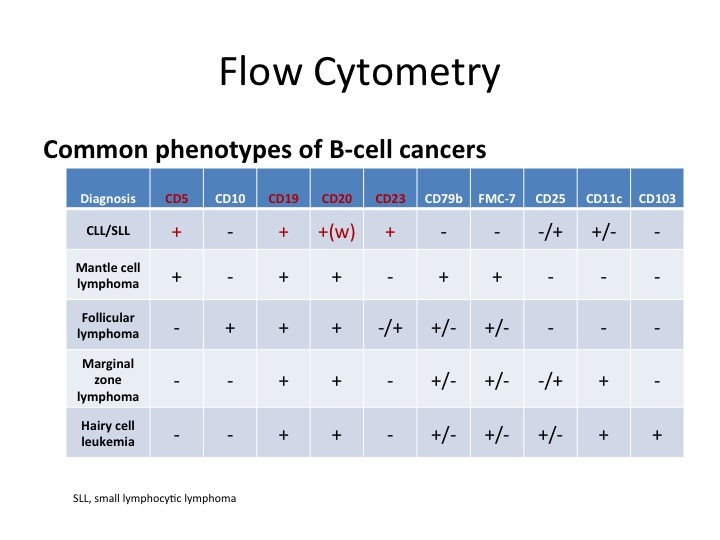 Its presence on monoclonal B cells is not expected and thus helps diagnose CLL. Perhaps this chart will help. 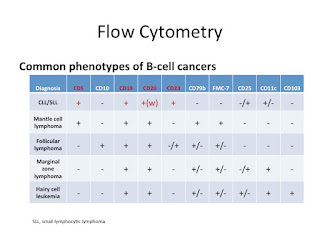 The information is gained from flow cytometry. Click on it to see a larger version. ANSWER: Immune recovery post transplant is slow and complicated and varies from patient to patient and even within each patient themselves. Different immune component may recover at different rates. 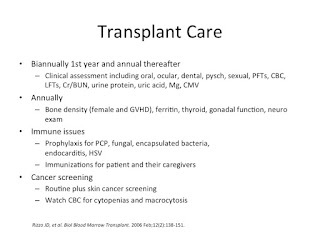 Suffice it to say, one can remain at increased infection and cancer risk for several years after transplant, but after about two years, much of the high risk period is behind you, that is assuming you are no longer on immunosuppressive drugs for graft versus host disease(GVHD) and you are well recovered. For example, routine vaccines are usually begun between 12 and 24 months post allogeneic stem cell transplant, suggesting that your humoral immune system is fairly robust by that time. 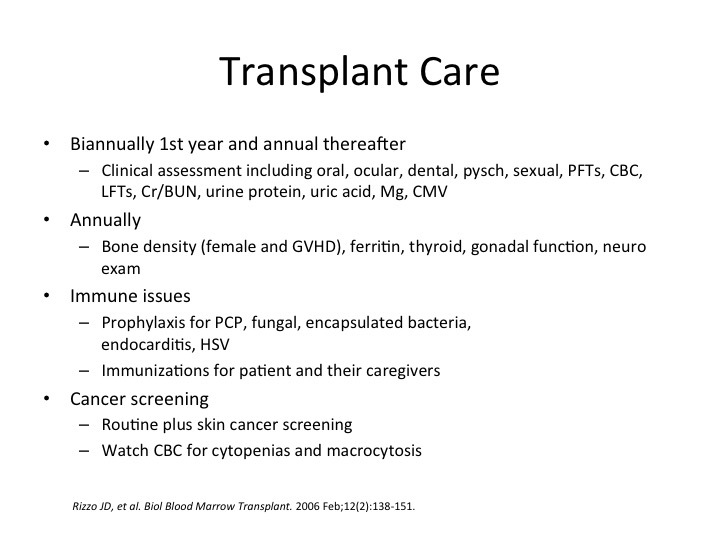 Below is some very basic outline of post transplant care. 3: In looking at the ASCO abstract, information is not provided as to the cause of treatment interruption. An interruption due to a drug complication or cll event may have a very different impact on PFS than a break in care for surgery. Is that data available? ANSWER: I wish I had that data too. I do understand that many of the patients were quite sick for multiple reasons and that's why they quit. Patients who go off drug for a week or so for a minor surgery as an example should expect better results. This week's new post on the CLL Society website http://cllsociety.org is an update of the data from trials with ibrutinib in treatment-naïve and relapsed patients presented by Dr. Byrd from an interview done at the CRC (CLL Research Consortium) meeting in San Diego in April 2015. Dr. Byrd presents the long-term data from patients having received almost three years of treatment with ibrutinib for chronic lymphocytic leukemia. The data are increasingly positive, however there are still concerns with relapse, especially in those with genetic instability such as those with 17p deletion or a complex karyotype. Still the news is good. For my take away points, and Dr. Byrd's upbeat message from the short part 2 of our interview at the CRC meeting, please here. I am part of this cohort as I am now 40+ months on ibrutinib with both 17p deletion or a complex karyotype, so this data is something I watch closely. I am on my way home from the North American Educational Forum on Lymphoma in Brooklyn, New York. Very tired, but satisfied. Honestly I didn't go expecting to learn much new on CLL, not that I am so aware that I think I have nothing to learn, but because this is not the forum for cutting edge news or research. It is more of a conservative recap, a review of the state of the research and standard of care and a prediction of where the future research might be headed. It is also mostly about lymphomas in general and less specific about CLL, though there are two good breakout CLL sessions and the general sessions are all very worthwhile. The reason I go is to connect with old friends and meet new ones and to see what alliance the CLL Society might forge with individuals and with other patient advocacy organizations. I am also looking for the unmet needs of our community, and trying not to replicate what others are already doing well. This is a really a meeting for patients to network and learn they are not alone. It is a great conference for newbies who are still overwhelmed with their recent diagnosis and want a helping hand and to learn they are not alone, and for those who want to learn the basics and get a glance at the future. Expect a few brief but important audio interviews with the CLL experts and with a couple of patients to be posted soon on http://cllsociety.org. But it is not so much much about breaking news, but about forming a community. if you haven't already, please check out our CLL Society's first newsletter that came out earlier this week. I am so proud of all the patients' voices that contributed articles. We are slowly but surely building a community.